On May 9, 2018, Office Depot released its first quarter 2018 earnings, its first full quarter results since completing the acquisition of CompuCom in November 2017. 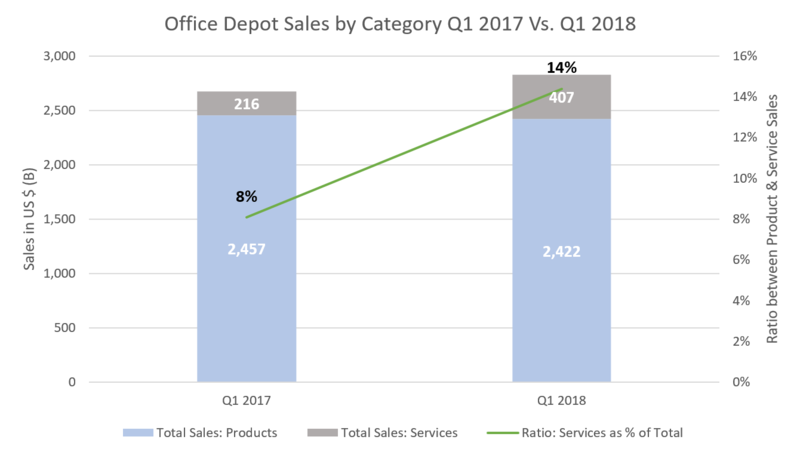 We've published numerous articles about the $25 billion plus of annual U.S. sales the combined entities of Office Depot and Staples have, terming this a "Blue Ocean" environment and ideal target for independent resellers to focus on. However, to be a legitimate contender for business in this sector, the changing requirements must be understood and developments carefully monitored. We've also made many mentions of how the largest entities, such as Walmart, Best Buy, Staples, Office Depot, etc. are all upgrading their capabilities to defend themselves against the onslaught from Amazon. Our point has been that, while we recognize Independent Resellers fear Amazon, we question whether they equally fear the emerging threat from Amazon's largest competitors, and whether they're looking far enough ahead to understand the overall threat is far greater than that posed by Amazon alone. We published an article on Office Depot's acquisition of CompuCom back in December 2017 that focused on two main points. First, this deal represents a make or break for Depot in their attempt to accomplish a transformation from transactional to service based sales and, second, if successful this initiative may also develop into another significant threat to the future of independent resellers. Transactions are fully exposed to the threat from Amazon, whereas services are less so. Successful implementation of service based sales slows down the loss of customers to Amazon. The threat from Office Depot (and perhaps also from Staples) to independent resellers is the potential for their transformation strategies to drain the "Blue Ocean" and eliminate it as an opportunity for independent resellers to sell into. We know the "Red Ocean" is cut-throat, and we know most independents fail to gain traction in the online marketplaces and, for the few that do, they make little to no profits. If Office Depot and Staples succeed with their transformation strategies and successfully convert a significant portion of their business away from transactions to service based sales, then where does this leave independent resellers in terms of their ability to penetrate the "Blue Ocean" market? We know the overall market is slowly getting smaller and we know the ONLY way to grow a business in a shrinking market is to increase market share. We also know independents face an ever increasing threat to their transactional business as opportunistic, "dot.com" spot-buyers seek online bargains and, in so doing, increase customer churn. The question becomes; how can independent, transactional resellers increase market share in a shrinking market where transactions are shrinking faster than the overall market is? A shrinking market, combined with increased churn, could become a fatal combination responsible for accelerating the decline of resellers. These threats facing independents are very real and no different to those that Office Depot faces, and is now positioning itself to try and overcome through its recent acquisition of CompuCom. It is this strategy that independent resellers must watch, learn very carefully from, and respond to, if they are to survive. 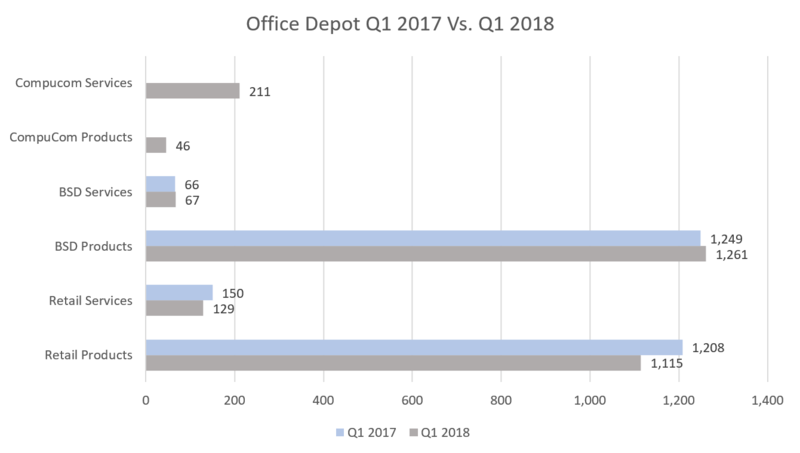 Office Depot's Q1 earnings report provides us with an opportunity to assess their initial progress integrating CompuCom, its operations and its value proposition but, more importantly, to assess the scale of the task that remains in front of them. Sales in the first quarter of 2018 were up nearly 6% year-on-year but, this includes the incorporation of CompuCom's sales into Depot's. Given Depot purchased $1.1 billion of annual sales with the CompuCom deal, then it was to be expected there should be around $250 million (actual $257 million) sales contribution in this first quarter of 2018. 1. A $257 million sales contribution from CompuCom masks a year-on-year decline on the Depot legacy business from $2.68 billion to $2.57 billion (3.8% decline). 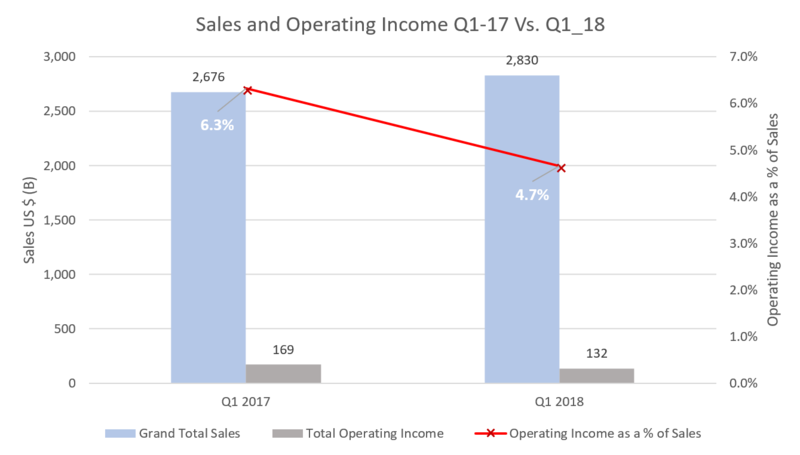 One of the call-out's during the management conference call that followed the earnings announcement, was the focus on the increased percentage of total sales coming from services, up year-on-year from 8% to 14%, or to $407 million. This is the sales number, along the percentage of total sales that it represents, that we will continue to focus on as Office Depot attempts to execute its transformation strategy. With services contributing 14% of total sales, there's still a long way to go before service sales provide adequate protection from the battering transactional sales are taking. What are the biggest transformation challenges Office Depot faces? CompuCom sales are made up of products (18%) and services (82%). Depot's plan is to offer their existing portfolio of products to the CompuCom customer base and, more importantly, offer the range of CompuCom services to the Depot customer base. BSD service sales were flat at $67 million. BSD product sales increased 1% to $1.26 billion - the first increase since 2012. Retail service sales fell 14% to $129 million alongside an 8% decline in retail product sales. Depot must create sufficient foot traffic back to the stores based on the demand for its service related value proposition to turn its retail division around. Apart from the benefit of incorporating pre-existing CompuCom sales into the financial results, there has been no progress developing service sales into Depot's retail and BSD channels. In fact, year-on-year, service sales in these channels decreased almost 10% from $216 million to $196 million. We know it's only been a few months since the acquisition, and we know the legacy sales channels will not adopt a service based value proposition overnight. However, regardless of the short space of time since the acquisition, for Depot's strategy to be successful, these channels must rapidly embrace its service based value proposition. 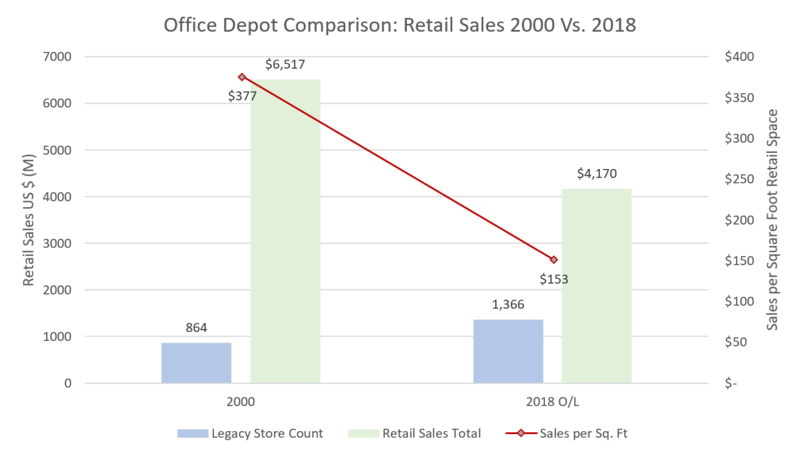 We thought it may be interesting to compare Depot retail between year 2000 and 2018. Very telling over this time frame is the decline in sales per square foot (based on assumed average of 20,000 sq. ft. per store) - down almost 60% from $377 to $153, while the store count has increased 60% to the current level of 1,366. With retail sales on office products expected to continue to decline, the weak average sales per square foot of retail space is a big problem. What's the outlook from this foundation? First, Office Depot is hosting an Investor Day on May 16, 2018 at the Mandarin Oriental hotel in NY City where they will provide details for long-term guidance regarding strategic direction, operating initiatives, and capital allocation priorities. Second, we've prepared our own outlook based on recent financial performance and market trends. We will observe with interest how this compares to the details expected to be provided at the Investor Day on May 18. Our objective with the material presented in the slide deck embedded below has been to apply our business and industry knowledge to Office Depot's latest set of financial results. In so doing, we have crafted our own view of the scale of the transformation challenge facing the Office Depot management. Office Depot management has a vision and they have a plan. One thing is for sure; having a plan does not guarantee success but, not having a plan certainly guarantees failure. To build a $5 billion services business from a $1.6 billion base over the next 5 years is a big job. Even more so, when the culture of the company is entrenched in transactional sales and that different selling skills must be developed for successful service selling. Office Depot will have to learn these skills, and learn them fast, leveraging what's been acquired with the CompuCom sales organization. For independent resellers who have the information technology platform and the selling skills to take on Office Depot and Staples in a transactional selling model, they may be well-advised to take a close look at Office Depot's strategic plan to convert their sales into a service based model. If Depot is successful with its efforts, this will transition items that have traditionally been purchased by way of conventionally priced transactions, into monthly subscriptions that serve to disguise prices on individual products and, therefore, become much harder to compete against. Office Depot has no choice but to attempt this transformation. The alternative is a continued decline in sales and profits which means, eventually, they would go out of business or be sold to someone who would implement their own strategy. Unfortunately, for independent resellers, the circumstances are no different so they, also, must transform to survive and, by observing and learning from Office Depot's experience, they may gain valuable intelligence on which tactics work well and which ones less so. The challenges facing independent resellers are significant. However, survival chances can be improved with an effective digital transformation strategy. See where you stand in your digital transformation by downloading our Analog Vs. Digital evaluation template.